If you’re one of the 31 million Americans with lower back pain, it’s safe to assume you’re not looking forward to a long flight. 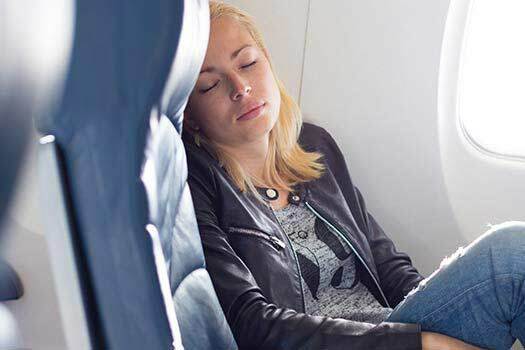 While some research suggests that nearly 90 percent of airplane travelers report some degree of back or neck pain during a typical flight, there are steps you can take to make your next flight more enjoyable. Here are a few tips to try next time you fly from the trusted spine surgeons at The Spine Institute Center for Spinal Restoration. Bring some OTC meds, like Tylenol, Advil or Motrin, with you in case the pain becomes too much. Let the flight staff know that you have medications so they can monitor you if you’re concerned about dozing off or experiencing other side effects. Keeping your knees at a right angle when sitting helps keep added stress off of your back. If you can’t naturally get into that position, ask for a blanket or pillow for support. Sitting up straight in your seat can also help. Skipping alcohol, coffee, and tea and opting for water during the flight can also help ease back pain. Taking warm gel packs or an empty water bottle can provide some added relief if your pain requires heat or cold therapy. Finally, getting some sleep or relaxing and enjoying the view can also help curb back discomfort. If low back pain has made daily life unmanageable for you, consider reaching out to an experienced spine surgeon who can pinpoint the source of your pain and identify a wide range of treatments including non-surgical options, spinal fusion, and motion-preserving spine treatments. Call The Spine Institute at (310) 828-7757 and request an in-person consultation today.